Lights-Out Machining Modern Machine Shop 89 For the Young brothers, shopf loor automation began by adding a bar feeder to an existing CNC turning center. This happened very soon after Gillen and Bob Young purchased Cookeville, Tennessee's, Custom Tool in 2008. (Gillen is president; Bob is vice president.) 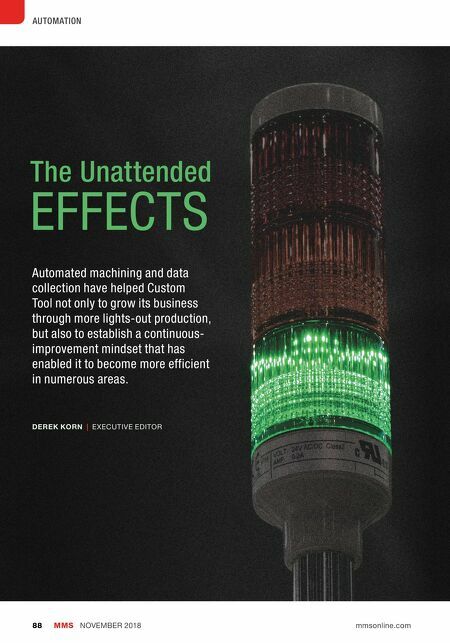 The bar feeder, which enabled a two-axis CNC turning center to run unattended for long stretches of time during staffed days, represented a significant shift in shop culture compared to how the company was previously managed. That is, automating a manual task was never contemplated to the extent that even payroll checks were still written by hand prior to the business acquisition. Today, various automation examples have been implemented, and the 13-person shop benefits from them in various ways. For example, two new bar-fed, Y-axis turning centers with subspin- dles, live tooling and parts collectors can be set up to run overnight with the goal of machining parts complete while getting as much production time out the available 15.5 hours the shop is not staffed. In fact, lights-out machining accounted for 30 percent of the shop's total production hours in 2017, and it is on pace to increase that to 45 percent this year. 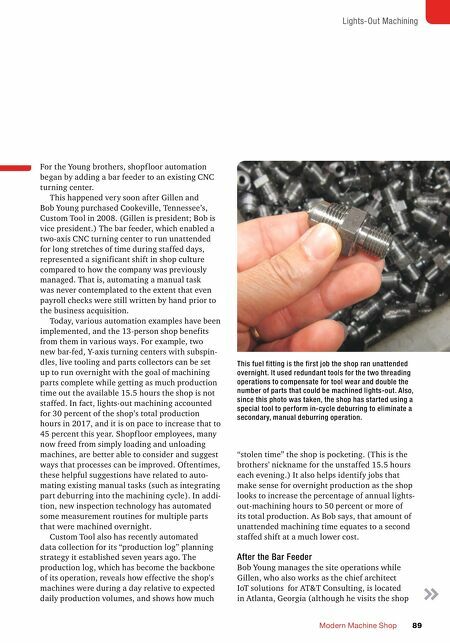 Shopf loor employees, many now freed from simply loading and unloading machines, are better able to consider and suggest ways that processes can be improved. Oftentimes, these helpful suggestions have related to auto- mating existing manual tasks (such as integrating part deburring into the machining cycle). In addi- tion, new inspection technology has automated some measurement routines for multiple parts that were machined overnight. Custom Tool also has recently automated data collection for its "production log" planning strategy it established seven years ago. The production log, which has become the backbone of its operation, reveals how effective the shop's machines were during a day relative to expected daily production volumes, and shows how much "stolen time" the shop is pocketing. (This is the brothers' nickname for the unstaffed 15.5 hours each evening.) It also helps identify jobs that make sense for overnight production as the shop looks to increase the percentage of annual lights- out-machining hours to 50 percent or more of its total production. As Bob says, that amount of unattended machining time equates to a second staffed shift at a much lower cost. After the Bar Feeder Bob Young manages the site operations while Gillen, who also works as the chief architect IoT solutions for AT&T Consulting, is located in Atlanta, Georgia (although he visits the shop This fuel fitting is the first job the shop ran unattended overnight. It used redundant tools for the two threading operations to compensate for tool wear and double the number of parts that could be machined lights-out. Also, since this photo was taken, the shop has started using a special tool to perform in-cycle deburring to eliminate a secondary, manual deburring operation.